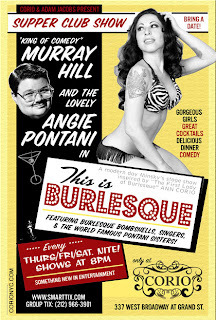 One of our own Kensingtonian's, World Famous Pontani sister, Angie is in a new burlesque show at the Supper Club and ready to give away tickets to a neighbor. The set of tickets are for next Friday so give her a shout at ramona@pontanisisters.com if you're interested. Show seems to be running for awhile so even if you can't go next week make sure to check it out.